Lots of things hold the reader’s attention, but what helps the most is having a story that is unpredictable. I don’t mean random, but just hard to predict. ‘What will happen next?’ is the question that will keep the reader hooked. One of the best ways to do that is by adding a twist, either one big one, or several small ones. Just when you think it’s going one way, do the opposite. You might surprise yourself. Every character has a secret, whether a small one or a big one. Write a scene where another character is close to finding out your character has a secret. There are clues and they think they have it figured out until your character confesses something completely different. As always your female character gets hit by her husband after a night out with his lads. She expects this even though she tries to avoid it. It goes down as it always does, until something unexpected happens. You decide what that is. Most people have had interviews in their life and there are certain expectations that come with it. Have your character go to an interview. Only this interview has a little twist. A meeting for addicts. Or is it? What exactly is this meeting? Make it clear through dialogue. What are these characters talking about, and why have they formed a group for it. Reveal it until the very end of the scene. Have fun and surprise yourself! Time does not really exist, so I suppose I’m talking about that moment where there are no pressing matters at hand and you are free to pursue whatever endeavour you wish. In this case, I’m talking about writing. I didn’t have a job for six months and now I do so I recognise the difference between being able to write all day and finding it difficult to dive into my written world during the week. To make time for yourself is important. Whether it’s to play the violin, read a novel, or write like a crazy bunny on drugs. Still, that is easier said than done when obligations are in the way. Not to mention the real life people that push the imaginary ones out of the way. This is why I found that it’s important to adapt whatever goal you have. I just felt bad when I didn’t reach the goal I usually had (2K a day). And most of the time I just stared at my manuscript and was like, nope, I won’t write more than a sentence. But a sentence is still a sentence. And it might spark more sentences. 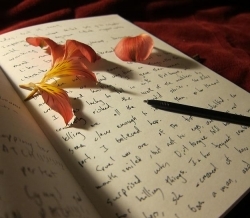 You don’t know until you write. So it helps to tell yourself to write five minutes, for example. Just set the timer and let those fingers dance over the keyboard. Even if you write complete rubbish. Just do it. When you wing it just like me, you follow the story, same as the reader will. This means that sometimes you will be stuck, and sometimes you will scrap things. And it’s okay to take time to brainstorm, in fact, that’s very good. So then take that time. Change your goal from writing every day to brainstorming every day. Make it as many minutes as you want. Maybe do it twice for five minutes. Or once for fifteen. You’re the boss. Your story is your companion at the time that you’re working on it, but if you stop spending time with it, it will distance itself from you. It will only make it harder to get back into the groove, plus you miss out on all that fun! Reward yourself with that time. Especially when you’re busy, you deserve that time with your characters. 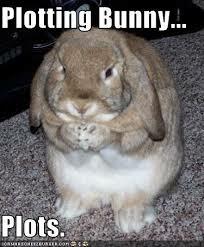 Funnily enough this post isn’t about how to plot or about bunnies. It is however, about the Plot ingredient which should always be in the Story Cauldron. I write character-driven stories because life is about people and books are about life, but this doesn’t mean I’m not big on plot. Even though the emphasis of a story might be on characters, that doesn’t mean that the amount of effort put into the plot should be any less than the effort put into characterisation. – A plot should always move towards the climax and its subsequent resolution. That is to say, keep the goal in mind. You should also be able to summarise your plot in one sentence. – There should also be a subplot, which you should also be able to summarise in one sentence. People who get stuck have usually lost sight of their plot and/or subplot. If that happens easily, it might be a good idea to make an outline before you start writing. That makes it easier for you to begin and stick to it once you’re halfway through that beast of a story. – The one-sentence summary should contain the goal. Every plot should have a goal because that’s how you know what obstacles you’ll add into the Cauldron. Here it is also interesting to create tension by giving the character traits that already don’t match with the goal. Characters make interesting obstacles. – There should be a set of mini-achievements for a character in order to reach the goal, they are usually reactions to the obstacles. This is especially clear in mystery, for instance. The goal is to solve a murder, they have a suspect, but then new information arrives and shows the suspect is not the killer. They have to use that new information to get closer to a new suspect and every time they uncover something, whether it sets them back or not, it all adds up to the eventual truth; everything leads to their goal. Cause and effect. – It should always be clear in which direction you’re moving, but you should still throw a few curve-balls at your readers to keep them on their toes. Subtlety is key here. Hint by sliding it past them, not by throwing the hint in their face. Also feel free to lay out false clues, but only one or two or your readers might feel tricked, in a bad way. Keep moving closer to the goal, even a setback for your character is still a motion. Move gradually, not like a bullet, but like a leaf in the wind. Never ever stop, because like a shark, your plot will die.